Baptised: 31st January 1889, Norwich – parents: Studd Woodroffe & Eliza Ann Clarkson. Died: 7th June 1917; age 28; KiA. Residence: 23, Handford Cut, Ipswich. Employed: as an Ostler at the Ipswich Arms. 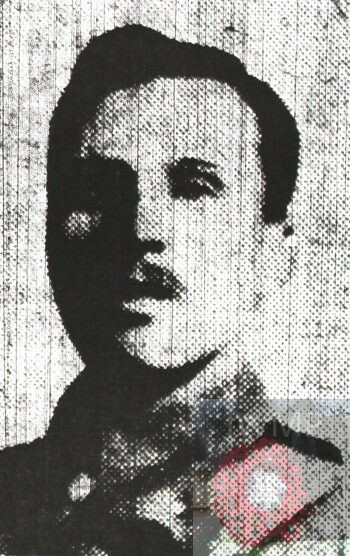 Date of Entry Therein: 27th September 1915 – France. Rank: 2nd Corporal; Service Number: 80988. Regiment: Royal Engineers, 106th Field Coy. 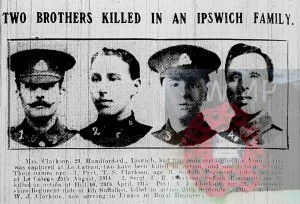 Relatives Notified & Address: Son of Studd Woodroffe Clarkson; husband of Ellen Clarkson, of 18, Handford Cut, Ipswich. Brother to ARTHUR JAMES CLARKSON & FREDERICK ROBERT CLARKSON. 1891 1, Austin Court, Norwich, Norfolk. Walter was 4 years old and living with his parents & brother. 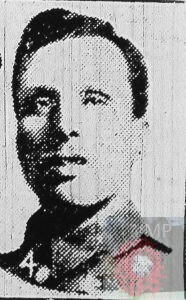 Studd Woodruffe Clarkson, 34, a Road Pavior, born St. John’s Green, Colchester, Essex. Eliza Ann Carkson (nee Woolner), 28, a Box Maker, born St. James, Norwich, Norfolk. Thomas Studd Clarkson, 6, born Norwich. Walter was 12 years old and living with his parents & siblings. Studd, 44, a Pavoir Layer. Thomas, 17, a Road Labourer. Walter was 22 years old, a Cattle Drover. He was living with his future wife and their son at the home of his parents & siblings. Nelly Barrell, 24, a Box Maker. Studd, 54, a Street Pavior – own account. Arthur, 15, a News Boy – Newsagents. William Clarkson Barrell, born April 1900, 8, Castle Street, St. Andrew’s, Northampton, Northamptonshire. Ellen Clarkson, born 1912, Ipswich. Walter Joshua Clarkson, born December 1913, Ipswich. Blanche Frances Clarkson, born 1915, Ipswich. Soldiers’ Effects to Ellen Clarkson – widow.